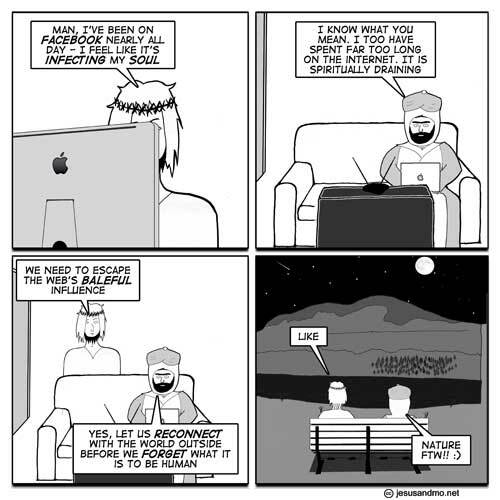 I would imagine for Mo it would be more than spiritually draining. Sure he’d be on Federal list somewhere….. I “like” this so much that I have just spent $20 getting a copy of volume 5 ‘Born Again’ shipped to me in London so that I may “share” it with people whose souls are less infected than mine..
One thing dawned on me, though.. why does it ship from the US when this is clearly written in the UK? … “wtf”, one might ask..
with with? Is Mo acquiring a stutter? @alexjolliffe – I think, but I’m not sure, that European orders are shipped from Spain. Thank you for buying one! Is that a Scud, a Qassam, a Katyusha, a Fajr, or just an ordinary shooting star? Ah, nature or nurture, the question that just keeps on giving. Because their free speech is better protected than ours? no! not the big blue room with the yellow button in the sky that doesn’t give you a context menu! Wow, is this the first comic that did not mention religion at all? Remind me if there was another…. Like! but not sure what FTW means? oh and author tell your wife you aren’t wasting your time, you’re doing public service. Idiots…don;t u all have any other works…! Learn ISLAM from MUSLIMs,not from non-muslims…! I thought FTW meant “for the win”…..
And “King” (if that is your real name (wait, that is actually a legitimate name…)), Author can draw whatever prophet he wants, doing whatever he wants, at any time he wants. It’s called free speech, for you unenlightened folk. @King: It’s not Muhammed. It’s a body double! Furthermore, it is your belief that Muhammed should not be depicted. Many other people do not have this belief. Are you so insecure in your belief that you cannot leave your god to deal with those who do not have the belief and ignore the prohibition? Brilliant, this is a stupendous point. We should apply it generally. So lets….. Learn insanity from the insane, not from the “non-insane”. Learn about sickness from the sick, not from “non-sick” doctors. Learn about the flat earth from Flat-Earth Believers, not non-believer scientists. “Ridicule is the only weapon which can be used against unintelligible propositions. I want to know how they can tell that its a depiction of the prophet. What are they comparing it with? Another picture? A personal memory? i like this cartoon wery much, you must tell your wife you dont waste your time to draw this cartoon. 74 people like this on facebook. 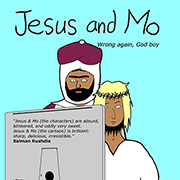 King, if you don’t like images of Mohammed the nonprophet or of his body double, don’t look at them. We can of course learn some truths about Islam by seeing how Muslims behave. You just called us idiots, so we can conclude that you are rude to people you don’t know. It is foolish to expect that other people have to accept the rules you apply to yourselves. AchillesAndTortoise: There was at least one non-religious strip before, after Kurt Vonnegut died (but I can’t remember an actual word to look for). Remember that there is no such thing as prophecy, and Muhammad (a bee cap upon him) was no more a prophet than you are! He was a supposed prophet, or a self-proclaimed prophet, or a putative prophet. Of course there is prophecy in the trivial sense that anyone can make assertions about the future, and the better-informed are more likely to be right. But as for what happens after death or at the end of the world, your ideas are as good as his. Of course the anagram should have been “bee cape”. They work equally well, just think of Muhammad buzzing around in his black-and-yellow cape. Or, even better, buzzing off! Is Mohammed going to cry if he has his picture drawn? Is he going to do one of his hissy fits and slaughter some more tribes? Kill some more Old Men for writing poetry? Drown some more victims in a well? Well, tough. He cant , he’s dead, and the imaginry sockpuppet Allah never even existed. I know, try praying to Allah to punish the unbeleivers. I’m sure such a mighty mighty moon-god as Allah can stand up for himself? or does he need his foaming gullible hordes to burn down a few embassys and slaughter a few schoolkids in revenge? So, the presumed reason for forbidding the depiction of Mo’ is that some believers will be tempted into worshipping the images themselves, as icons. Once again we see a patronising attitude from the purveyors of the religion towards their dupes. Not only must they be protected from the provocation of their uncontrollable lust, but also their willingness to worship drawings. Strange then, how the prohibition of the images puts so much power into them when the idea was to keep them from gaining power. Did I miss something? Why’re people talking about the author’s wife? I don’t remember the author ever even mentioning a spouse. That’s nothing. My wife thinks my PS3 is a waste of time. Really, what is it with wives..? PS Author – superb work. Please keep it up. International fame awaits (one day) as the puncturer of a crucially important balloon – religious dogma. facebook and so on are indeed a waste of time!!! we can use that moments for another things!! !